The founder of Rose Writers Creative Writing Workshops, Desiree is on the Thursday panel, “Submitting Across Regions and Genres” with Santa Monica College professor Anita Gill, Columbia University digital content manager Sara Alaica, and YA novelist Cynthia Rosi. All are chapter leads of Women Who Submit, a national organization that helps women and nonbinary writers with best submission practices. The Antioch Creative Writing MFA grad said she was hesitant and worried about rejection when she began submitting her work. That changed when she met members of WWS. “I literally don’t think I’d be doing it if it wasn’t for them,” she said. Desiree said she also plans to attend an Antioch alumni event and a reception for Running Wild Press, which is publishing one of her short stories in its upcoming anthology. She will also be looking for publishing opportunities for her novel, Lucky John. Michelle is on the Saturday panel, “Post-MFA vs. POC: Five Poets Speak About and Read from First Books.” The author of Why Can't It Be Tenderness, selected by Aimee Nezhukumatathil for the Felix Pollak Prize in Poetry, she holds an MFA from California State University, Fresno, and is a PhD candidate in Creative Writing and Literature at University of Southern California. Michelle will also be doing a book signing and off-site reading with her publisher, University of Wisconsin Press. For details, visit http://www.michellebrittanrosado.com .“I’m really looking forward to it since it will be my first AWP since my book came out,” she said. This is also her first panel. “I’m excited this panel will help represent the perspective of writers of color, particularly emerging writers with first books. It will hopefully be helpful to early-career writers who are seeking community and support on the path to publishing their first collection or book,” she said. At AWP, Li Yun will be signing her chapbook, Words on Water, at the Finishing Line Press booth on Wednesday and Thursday. In addition, she hopes to connect with friends. You can read about Li Yun's full AWP strategy on her website. 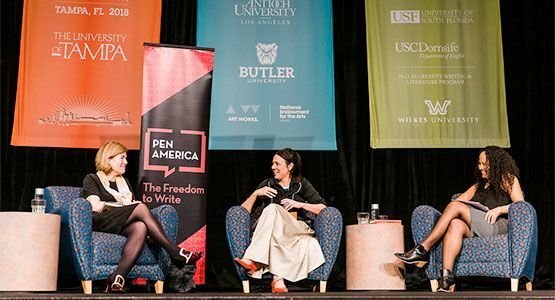 The largest literary conference in North America, AWP features over 2,000 presenters and 550 readings, panels, and craft lectures. Its bookfair hosts over 800 presses, journals, and literary organizations from around the world.